Spain, 2009, 129 minutes, Colour. Penelope Cruz, Lluis Homar, Blanca Portillo, Jose Luis Gomez. After the serious themes of his films from the last ten years or more, Almodovar takes a more relaxed approach to a film about film-making and obsessions, light with serious touches. The film opens mysteriously with a blind screenwriter who used to be a director. When he hears news of the death of a tycoon in Madrid, it initiates a story about the tycoon's son wanting to make a film about/against his father. This leads to memories and flashbacks: the tycoon and his secretary, Lena, her becoming his mistress, her wanting to act in films, her involvement in the film and the tycoon producing, her affair with the director. The son, meanwhile, is on set and videos everything. What happens doesn't need rocket science to anticipate. Rather, it is the pleasure of watching the glossy proceedings with Almodovar's elegant and colourful touches and the performances. Jose Luis Gomez is the sinister, obsessed tycoon, Lluis Homar is the director. Blanca Portillo is very strong as the agent who has kept secrets for years. 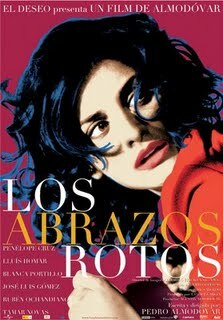 And, of course, Penelope Cruz who can't but help illuminate the screen with her charm, beauty and presence. 1.Almodovar with the light touch? The blend of drama, comic touches, love, relationships, film-making? 2.The background of the 1990s, social concerns in Madrid? Film-making? Holidays, Lanzarote? The contrast with 2008? Madrid, film-making and editing? The musical score? 3.The focus on relationships, the title? Love, obsession, the consequences? 4.The introduction to Matteo/Harry? The voice-over of Harry, his comment about his identities, identifying as a writer? Blind, at home, talking to the girl that helped him, the newspaper information, the death of Ernesto, the sexual encounter, Judid and her arrival, her looks and comment? The girl leaving? Diego arriving, working with Harry, their writing? Ray X and his arrival, his pitch about making the film about his father, his dislike of his father, homophobia? Matteo getting Diego to check the photo, identifying Ray X as Ernesto’s son? Diego seeing the photo of Lena? Diego and his work with Harry, the discussions of vampires – and the humorous and elaborate scenario about vampires for a film? 5.Judid, Harry’s agent, fussing about him, stern, Diego’s mother, her having to go away for her agency work? Diego and his work as a deejay, his friends in the club, the drugs, his collapse? Harry and his keeping vigil, helping Diego recover? 6.Judid and her secrets, Diego’s reaction to his mother’s secrets? His asking Harry? Harry narrating the events of the 1990s? The occasion for flashbacks? 7.The earlier introduction about Ernesto, information about his illness, his being held for fraud, his imprisonment? The past, 1992, Lena as his secretary? Her being upset while he did dictation? Her father’s illness, going to the hospital, discussions with her mother, taking the father home? The need for money? Her identity as a callgirl, the phone calls to the director, Severine? The irony of Ernesto phoning? Her anger with the madam? Two years passing, her being Ernesto’s mistress? The comment about her having to be an actress in playing this role? Her wanting an audition for the film, to be an actress? Meeting Matteo, the awkwardness of her audition? Her return? Ernesto’s suspicions, wanting her to be the equivalent of a wife, decorating the home? Lena and the success and her being employed? 8.Matteo and her being smitten, the filming, the relationship, their deceiving Ernesto, Lena performing for Ernesto? 9.Ernesto Jr, spoilt young man, the two marriages, gay, his partner, his manner? In the 90s, on the film set, his appearance, filming everything? The later information about his video, the documentary? Wanting to complete it with an interview with Matteo? 10.Ernesto, the lip-reader, spying, his producing the film, controlling it, the weekend with Lena, her reaction, his playing dead, the lip-reading and his discovering the truth about her deception? 11.Confronting Lena, pushing her down the stairs, her being in hospital, her making the deal about finishing the film? Her poor performance, Matteo’s concern? The rewrite to explain her being in a cast? 12.Matteo and Lena escaping to Lanzarote, the weeks passing, reading the bad reviews? In the car, the kiss, the lights, their being hit by the car? Lena’s death? Matteo, the surgery, blind? 13.Judid’s return, Matteo becoming himself rather than Harry? Going out to dinner to celebrate, Judid telling the complete truth, about Ernesto, her own jealousy, she and the editor ruining the film? 14.Matteo going to Ernesto Jr, his threats? Diego watching the video? The reality of the last kiss, Ernesto helping them to get to hospital? 15.Judid having all the old stock, her decision, Matteo wanting to edit it, the group watching the scene – the light and jokey nature of the film, the girls and suitcases, Lena with the older woman, the drug dealer, the comments about sexuality…? 16.The happy ending, embraces broken and repaired? Matteo and Diego being his son – finding out or not?